Brushing with too much pressure is one bad brushing habit that can damage parts of your mouth. Brushing your teeth harder doesn’t get them cleaner. In fact, too much elbow grease can cause or worsen receding gum lines. Plaque is a sticky but soft film that doesn’t require hard brushing to remove. Remove plaque by brushing both your teeth and along your gum line in gentle, back-and-forth strokes at a 45-degree angle. If you notice tooth sensitivity, swelling, and bleeding, ask your dentist if you may be brushing too hard. These could also be underlying symptoms of gum disease. Aggressive brushing could cause symptoms to get worse. The American Dental Association recommends using a soft-bristled brush, no matter if it’s a manual toothbrush or an electric one. Medium and firm brushes are abrasive and can damage your gums and teeth enamel, causing sensitivity and bleeding. Look for toothbrushes with the ADA Seal of Acceptance for extra reassurance. Make sure the toothbrush fits in your mouth comfortably. If you have to stretch your jaw to brush, the toothbrush head may be too large for your mouth and may not clean hard-to-reach spaces properly. 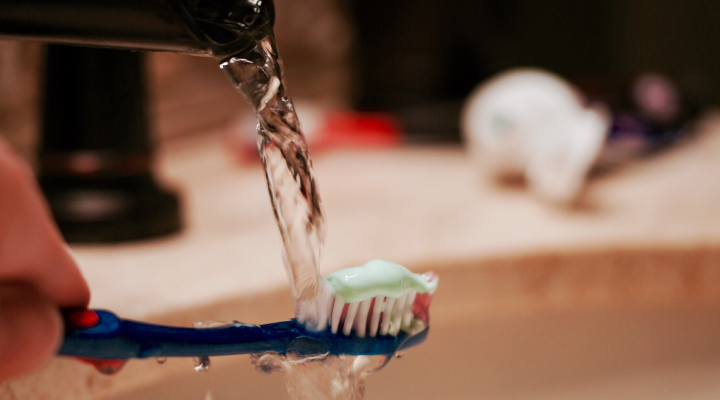 Make sure to replace your toothbrush every three months or sooner if the bristles are frayed. Never share a toothbrush, even with a family member or significant other. You’ll be sharing bacteria and potential cavities back and forth! Store your toothbrush upright in a cool, dry space. Putting a wet toothbrush in a closed container promotes bacteria growth, which can negatively affect your overall health. It’s easy to fall into the bad brushing habit of not brushing long enough. On average, people spend about 45 seconds brushing their teeth. That’s well below the recommended two minutes for a clean mouth! A proper, two-minute brushing includes cleaning the outside surfaces, inside surfaces, and chewing surfaces of the teeth. Use a phone or kitchen timer to keep track, switching from right, left, top, and bottom every 30 seconds. Hold your toothbrush vertically to get behind the top and bottom front teeth. Remember, a clean mouth isn’t limited to just teeth. Be sure to brush your tongue and the roof of your mouth, too! Don’t forget to floss! Need a refresher on why flossing is important?